With a burn time of over 15 hours, you'll love the soothing, warm glow of Honey Candles® 100% Pure Beeswax 2 Inch Votive candle. 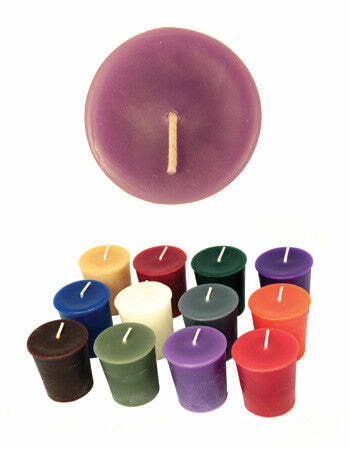 For centuries, votive candles have been used to uplift the soul in spiritual ceremonies around the world. For such experiences, there are few choices better than pure beeswax candles. Handmade in Canada, Honey Candles® use only natural, environmentally-friendly ingredients: 100% pure Canadian beeswax, and cotton wicks. No solvents, no lead or zinc, nor any other toxins commonly found in candles. Good for the world, and good for your health, too, as beeswax candles emit distinct compounds when they burn, neutralizing airborne contaminants and allergens. Better yet, beeswax candles produce a natural glow that is closest to sunlight. Tip: Beeswax votives are unique in that they are designed to fully liquefy as they burn. That means they need to be lit in a cup. Try a clear glass votive cup - you'll be pleasantly surprised at the ambient glow that it creates.